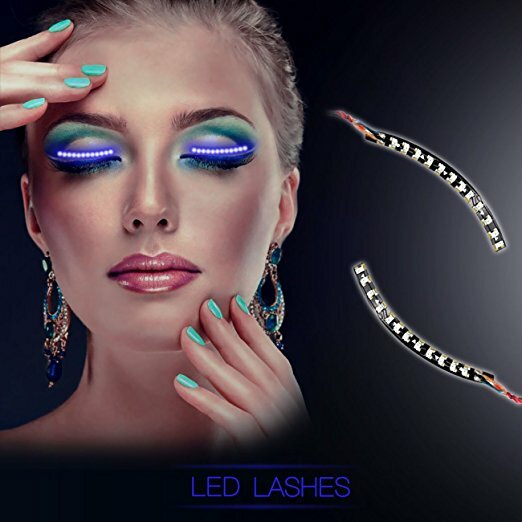 False eyelashes with LED lights are already a reality! Did you think the future had come with the invention of magnetic eyelashes? These LED eyelashes will make anyone shine – literally! The invention, called F.Lashes, was exhibited at the Maker Faire in the United States. The eyelid strips with LED light are attached to the person’s eyelids with a common glue used for the false eyelashes. Two thin wires wrap around the head to connect the eyelashes to the battery source at the back of the head. The designer Tien Pham demonstrates it by pushing a button attached to the battery and makes the lights go from side to side, blink and follow other patterns. Lights can also change according to the movements of the head, following the rhythm of your dance. LED eyelashes have several different light colors that can fit your event. You can try pink, red, blue, light blue, white, yellow and green. 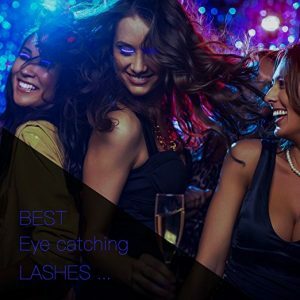 So, are you looking for an incredible look to get attention in that party you are going to? Then stop looking, because you just found the trend of the moment and that will make you stand out in the crowd. Although it does not give a pleasant look in daylight, this accessory is not visible in the dark or at night. It can only be seen when its lights are on and thus illuminating the lashes. As mentioned, to supply power to the small bulbs, the battery connects to the LED eyelashes by a thin, almost imperceptible wire. The power module which holds the control button is attached to the hair by a regular hair clip. F.lashes change the pattern of how the LED lights turn on and off with head movements. Depending on which LED eyelashes you buy, the controller button may cycle through a variety of modes such as steady light, blinking, etc. The original developers say that the battery lasts four hours of continuous use. However, aftermarket products can last longer than that. To put them on, put some glue on the LED strips and apply to the eye like a fake eyelash strip. They are a bit hard, so it will be a bit of a fight. When it is time to remove, the care is also simple. Remove them gently with warm water. This will prevent natural eyelashes from being plucked. You can remove the residue of the glue with neutral soap and warm water. A good tip is a use a baby shampoo. For those with sensitive eyes, another possibility is to use a cotton swab with a small amount of moisturizer compatible with your skin. Even though they are advertised as extremely light, after wearing them for a bit, you can feel the weight and discomfort on the eyelids. Try them on for a night at home before going out for a full-night dance. Alternatively, be prepared with a means to remove them on the go if needed. The best thing? F.lashes is totally shock-safe. Neither the chip nor the led lights pose any risk to the wearer, as they use very weak batteries. The developer also claims the lashes themselves are water-proof. However, I recommend that you consult your ophthalmologist (licensed eye doctor) to make sure the LED bright lights are totally safe. Also, dermatologists generally recommend using glue-based lashes only for special occasions. Don’t forget the eye is a delicate thing and everything around it is not meant to be abused. Be very careful when putting them on and taking them off. Apply the glue only to the false eyelashes and never directly to the eyelids. Never share with other people so you avoid infections. Eyelash falling out is common, but keep in mind that if it is too much, it is important to see a doctor. Excessive fall may be a sign of allergies, blepharitis, nutrient deficiency or even some autoimmune disease. This is a must-have accessory. Even if you are not sure you would wear them in public, it definitely worth trying to kill the curiosity. Waterproof LED Eyelashes with Sound Control Interactive is the one that I have and really enjoy. It is very easy to wear. It has nine flashing modes, giving you fabulous eye-catching shining look. The company selling this product promises a battery lifespan of over than 120 hours, but I haven’t worn them for that long to confirm.